Did you know the average commercial building wastes approximately 30 percent of its total energy? Not only does this loss have substantial implications for the environment, but it also significantly impacts your bottom line. Plus, we’re seeing increasing legislation that requires energy loss improvements for existing buildings. The good news is there are many actions commercial building owners and property managers can take to reduce wasted energy in their buildings. Below we list six strategies that will help you maximize your energy and cost savings. Well-maintained ventilation is a key contributor to a healthy building. Staying on top of air filter replacements prevents dirt and dust from building up over time, and consequently keeps fans from working unnecessarily hard. Additionally, frequent replacement of filters creates healthier environments that are easier on your tenants’ respiratory systems. The recommended frequency to change air filters varies depending on the type of facility – smaller buildings typically need a change every 12 weeks, while industrial facilities may require an air filter change every week. 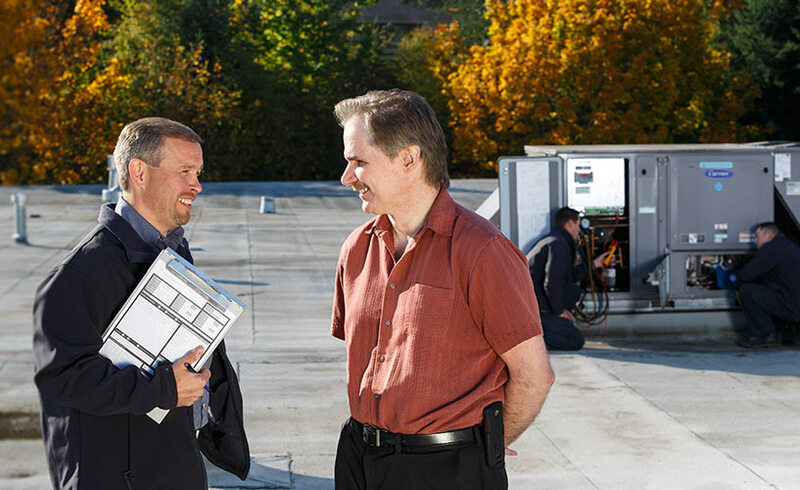 Your HVAC technician can set up a schedule for the right replacement frequency for your building. Programmable thermostats are an ally in cutting energy costs. Be sure to set the thermostat at energy-saving temperatures for long periods of time and avoid overriding pre-programmed settings – especially when no one is in the facility. 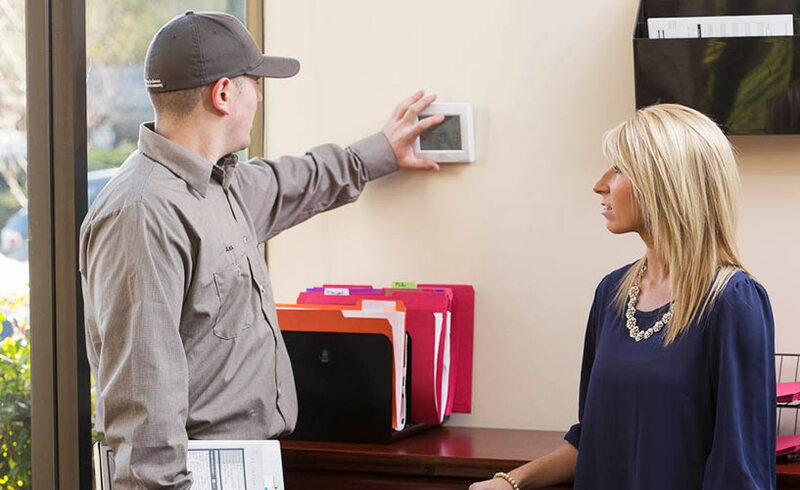 If you have multiple zones that require heating and cooling, it may be a worthwhile investment to use a programmable thermostat in each area of the facility. This compartmentalization will help your tenants to feel more comfortable and avoids excessive heating or cooling in each zone. Advanced control sensors – or energy management systems (EMS) – sense the number of people in a room and automatically adjust the temperature accordingly. Installing advanced control sensors can dramatically improve the operating power and energy efficiency of your ventilation systems: when integrated with a facility’s HVAC system, this technology can reduce energy use by nearly 40 percent! And the energy savings translate into cash savings: according to PGE, this technology can cut costs for a 500,000 square-foot office building by tens of thousands of dollars each year. 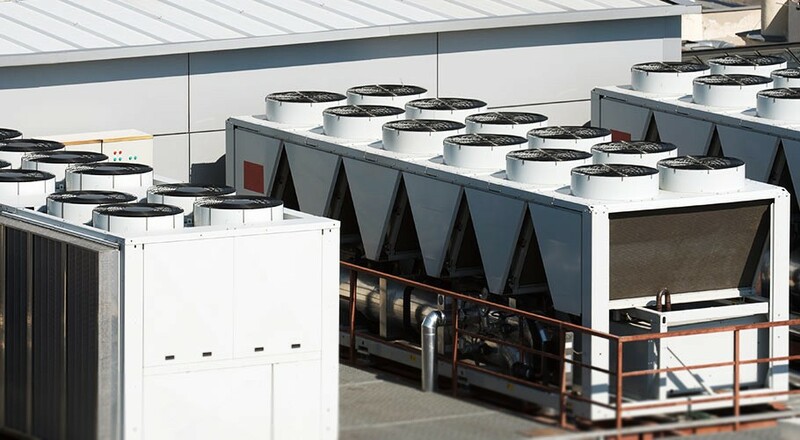 HVAC equipment has significantly improved over the past decade – buildings that have had the same heating and cooling system for more than ten years can quickly cut energy costs by upgrading to a modern and efficient model. Although the price may be greater up-front, you can save nearly 20 percent in energy costs by upgrading to high-efficiency, In the decision process, look for HVAC equipment that features high energy-efficient ratings, a simplified wiring system, an easy-to navigate controller, and the ability to conserve energy during a partial cooling operation. Proper HVAC upkeep directly benefits your bottom line. As we discussed in a previous Reitmeier blog post about HVAC maintenance and profitability, a maintenance plan extends the life of your equipment and reduces your overhead by reducing energy consumption and minimizing costly equipment failure. Property owners and managers can save anywhere from $250 to $500 per year per unit in taking this initiative. Regular HVAC maintenance plans offer several benefits – for example, Reitmeier’s plan includes scheduled inspections, air filter maintenance, and emergency 24/7 call coverage. With this support, you can reap energy savings without unnecessary stress. Ask your utility company if they offer free or inexpensive energy audits, which involve high-tech equipment and the careful eye of a trained inspector. At the end of the audit, you’ll receive a written report that details the facility’s problem areas and recommends next steps. In knowing the exact issues and proposed solutions, you can confidently move forward with a plan to save energy and cut costs. While reducing your monthly bill requires a small up-front investment, the time and energy you spend will result in sustainable solutions with noticeable benefits. Acting on these energy-saving tips today will pay off significantly by improving the health of your building – and your bottom line. To schedule a free no-obligation assessment of your HVAC equipment and current maintenance condition, request a quote or click here to learn more.